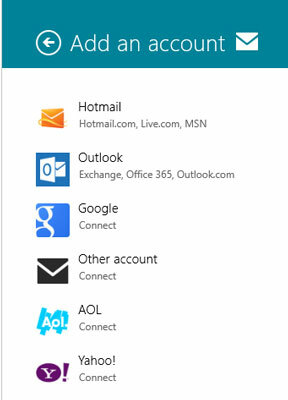 The Windows 8.1 Metro Mail app has built-in smarts for you to connect to any Hotmail/Outlook.com, Gmail, Exchange Server (including Office 365 business edition), AOL, Yahoo!, or IMAP accounts. You can add any number of different types of those accounts — two different Gmail accounts and a few Hotmails — no problem. To add a new account, fom the Metro Mail app, swipe from the right edge of the screen or hover your mouse in the upper-right corner, and choose the Settings charm. 1Tap or click Accounts; tap or click Add an Account. The Add an Account list appears. 2Tap or click the account type that you want to add. Yes, where Metro Mail says Hotmail, it actually means Outlook.com. 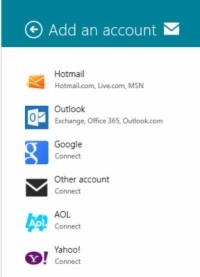 The Other Account entry is for adding e-mail accounts that can be accessed using IMAP. If in doubt, contact your e-mail provider to see if it supports IMAP. When you add an e-mail account, you’re also adding the contacts from that account, which go in your People app, and the calendar(s) attached to that account, which go in the Calendar app. It’s an all-or-nothing proposition. 3Enter your e-mail ID, password, and any ancillary information that may be required. Tap or click Connect. Metro Mail is probably smart enough to look up or find any other information it needs, but you may have to provide something from your e-mail provider. When Metro Mail comes back, your new account appears on the left. 4If you want to change the details about your account, bring up the Settings charm, click or tap Accounts, and then tap or click the account you wish to change. The Account Details pane appears. In the top box, you can type a name that will appear in the first column of the Mail main page. You can also choose when to download new messages and how far back you want the messages to go.